Until November 2, Volkswagen Netherlands is offering special discounts on their commercial vehicles during Vriendenprijsweken (Friends Price Week). 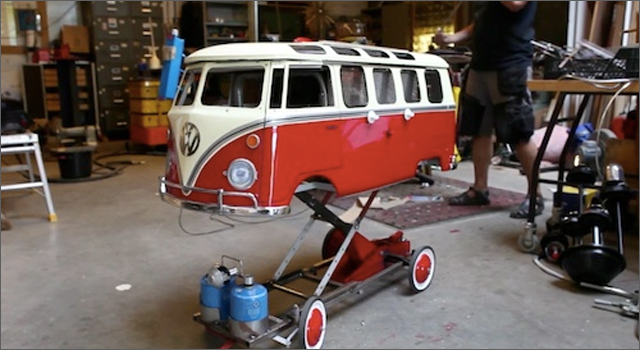 To further promote the campaign, Dutch metal-artist and designer Thierry van Raay was recruited to create a fully functional BBQ in the form of a classic Volkswagen Transporter T1. To win the van, eligible participants (i.e., residents of The Netherlands 18+) allow the BBQ-BUS Facebook app to scan their most recent 50 photos to determine how many friends are recognized in the photos (my scan found 20 faces, several of which were my own). The images that the application locates, are then displayed on bodies of a line-up of hungry construction workers, which can then be shared on the user’s Facebook timeline. On October 17, a winner will be randomly selected from eligible participants to take home the one-of-a-kind BBQ bus. The campaign was created by Amsterdam-based creative agency Achtung!